Alarm bells are going off in Houston (record flooding) Mumbai (record flooding) the Arctic (no ice) across Europe, the Middle East and here in CALIFORNIA (record extreme heat). We cannot let dirty fossil fuel interests continue to determine our future.Send a letter now, your state representative needs to hear from you. Let’s move NOW to 100% clean energy! 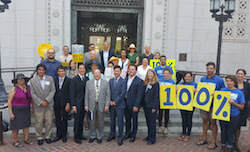 You can help California reach 100% clean and zero carbon electric system by speaking up for SB 100. This bill has already passed the state Senate. We need to make sure it passes in the more conservative Assembly in the next 10 days. The oil industry, large utilities, the Chamber of Commerce and other business oppose this bill. But the price of fossil fuels is greater than transitioning to clean energy. We must be stronger and louder than they and their money are in our state Capitol. SB100 will create thousands of new green jobs, clean our air, and maintain California’s leadership on climate change issues. Public pressure from you and your friends can make sure the Assembly does the right thing. Your Assemblymember needs to hear today how important this issue is to you. It’s way past time to move beyond dirty fossil fuels. Your action will help show strong public support (and demand) for 100% clean, carbon-free energy in California.